The still image is a snapshot of the Earth created from a year’s worth of data from April 2012 to April 2013. 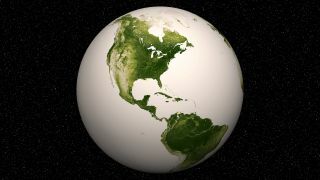 Subtle differences in shades of green in this animation reflect vegetation conditions worldwide. High values of Normalized Difference Vegetation Index, or NDVI, represent dense green functioning vegetation, and low NDVI values represent sparse green vegetation or vegetation under stress from limiting conditions, such as drought. This image was released June 19, 2013. Scienitsts have pieced together a year's worth of photos from the powerful Earth-watching Suomi NPP satellite to create the most detailed look ever of our world's plant life as seen from space. The amazing maps of Earth's vegetation highlight areas where plant life is the densest and barest, while leaving out the 75 percent of the planet that is covered in blue oceans and seas. The darkest green places represent lush vegetation and the pale sections show terrain where plant life is sparse due to deserts, rocks, snow or urban sprawl. The Suomi NPP satellite, short for National Polar-orbiting Partnership, is a minivan-sized spacecraft perched 512 miles (824 kilometers) above Earth. The $1.5 billion satellite is designed to collect data for short-term weather forecasts and long-term climate models as part of a partnership between NASA and the National Oceanic and Atmospheric Administration (NOAA). Subtle vegetation changes are visible in this year-long visualization. Large-scale patterns vary with seasons, but the local variations in green are also sensitive precipitation, drought and fire. High values of Normalized Difference Vegetation Index, or NDVI, represent dense green functioning vegetation and low NDVI values represent sparse green vegetation or vegetation under stress from limiting conditions, such as drought. This image was released June 19, 2013. Suomi NPP's new images are based on data collected from April 2012 to April 2013 using the satellites Visible-Infrared Imager/Radiometer Suite, or VIIRS. The instrument is designed to detect changes in the reflection of light on Earth, which can be a good indicator of the health of plants on the ground. Measurements of how vegetation changes over time can influence weather and ecological forecasting, NOAA officials said. Minute, pixel-sized changes can serve as an early warning for drought, fire conditions or potential malaria outbreaks, for example. The data will be incorporated into the Normalized Difference Vegetation Index (NDVI), a measure of plant growth, vegetation cover and biomass based on light reflected. High values on the NDVI indicate lush, healthy vegetation, while low values represent sparse or stressed-out vegetation that may be experiencing drought, according to a NASA statement.